The “TSE Alumni” association is a non-profit association (under the French law of 1901), created in november 2012 counting nearly 2,500 alumni. To ensure the connection between Alumni from all graduating classes in France and abroad, to develop friendly cross-exchanges between them on the professional and personal levels. To promote the image of the Toulouse School of Economics – TSE to the corporate world, particularly by promoting the dissemination of internship and job offers. To help the School achieve its high level economic education goals by maintaining its relationships with its management, teaching faculty and students. 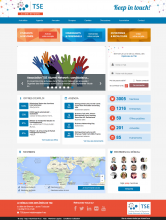 In order to achieve these goals, TSE Alumni wished to provide its members with a platform of job offers, a group system that allows them to organize events by region and by country but also with a shared calendar in which the school and the association communicate about upcoming events of both entities.